As one of us the leading dive centres in Malaysia, Dive Station is a one-stop hub for all your scuba diving needs. 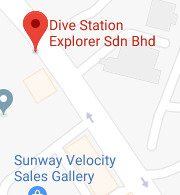 Conveniently located in the heart of the city, we offer a wide range of diving products and services catering to amateur and professional divers alike. We provide a comprehensive array of high-quality diving equipment that meets international standards, featuring everything a diver needs to explore brave new depths safely and with complete confidence. With our team of highly-experience diving instructors, we also conduct an entire spectrum of PADI dive courses ranging from Open Water all the way up to Master Instructor level professional courses. These are available all year round, so you can start indulging in this pleasurable pursuit at any time. Speaking of pleasure, our guided diving trips will take you to the most spectacular dive sites on the planet, where you can explore an incredible undersea world you never thought existed. Our expert dive crew will literally take you to previously unknown depths where breathtaking sights and experiences await you. From off the vibrant coasts of Malaysia to distant shores far beyond the boundaries of the country, these thrilling adventures are truly not to be missed. You can also immortalise your memories of the deep blue yonder with our underwater photography courses. Capture the calm beauty of the vast oceans teeming with colourful life and leave your friends absolutely breathless. Steven Cheong finds silence and peace being underwater, being mesmerized by the beauty of what the underwater world offers. Being a learned diver who was and still constantly attracted to the underwater world, he gradually became an instructor in order to teach the skills of scuba diving to others as an invitation to witness and share the beauty of what the nature beneath the sea has to offer to the world. He sees that there is no end to beauty to what the underwater world offers and knows that all those who join him in this endeavor will agree with him.